Transform your favorite photo into a one-of-a-kind drum style lampshade. 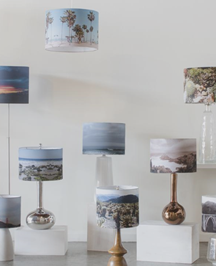 Simply select your desired size, upload a personal photo and your luxury custom lampshade is handmade on demand. Materials: High quality, handmade lampshade featuring your personal photograph. Photo is printed on luxurious 100% organic cotton sateen fabric and adhered to stiff styrene backing for a firm, modern drum shape. State-of-the-art printing technology ensures optimal photo clarity and definition. Vibrant coloring comes from non-toxic, 100% biodegradable inks. Your photo will glow brightly with vibrant colors and high contrast blacks and whites when illuminated from within! Process: Whether it's a beautiful vacation picture, a cherished family photo, or a candid of your furry friend, we make it easy to bring special moments to life. Simply upload your high-resolution photograph (150 bpi or greater preferred) and our talented designers take it from there. We will retouch and size your photo file for optimal fit with your lampshade. Don’t worry…each photo file is carefully checked for quality, and if there are any issues we will contact you to resolve. Custom Photo Lampshades ship in as few as 2-3 weeks. Specifications: Drum Photo Lampshades come in 8”, 10”, 12”, 14” and 16” diameters. Shades are made with a standard washer fitter for traditional harp style lamp fixtures. Looking for a different size or configuration? Contact us to explore options. Any Questions? It is common for our customers to have questions regarding Photo Lampshades. If you have any additional questions or special requests please click here to send us an email or give us a call.